The figure and subtle tones of finished wood have appealed to the human spirit ever since the first board came off the saw. With each piece of furniture I make, I look for what the wood is already saying, and I design for the best possible way to enhance these elemental aspects in the most graceful line, form, and structure that can be drawn from the wood. Because a carefully designed and crafted piece of furniture stays close to its roots, it can fit into any setting. Within the framework of my given style, I make each piece to order, to meet individual needs and fulfill particular functions. I assist the people I build for in interpreting and realizing their own ideas in final form. The simplicity of my style is meant to complement and enlarge upon an established atmosphere, and my pieces are equally at home among period pieces or added to a casual living space. For as many years as I’ve been making furniture, I still work alone. I take each piece from concept to its own degree of finish. To achieve the quality I’m looking for, I rely on tools and methods of joinery that are time-honored and respected as that of master practice. Each piece is signed and dated, having been built to last from one age to the next. My early influences in woodworking were my two grandfathers, one a patternmaker and cabinetmaker and the other a jewelry designer who also built fine furniture for his own use. Although I pursued other interests for a while, receiving academic degrees in chemistry and starting off on a career in environmental protection, it was their timely inspiration that I came back to follow. 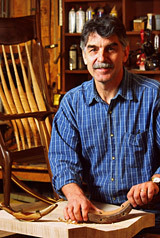 Specialty woodworking and custom furniture making have been my trade for the past forty years, and my award-winning work has found its place in homes across the country. In the late hours I play jazz in the New Hampshire/Maine Seacoast area on an instrument of my own making. I live with my wife, award-winning poet, Audrey Bohanan, and our four cats in South Berwick, Maine. Please contact me to discuss design requirements or for commissioning work. My studio is open by appointment; please call for directions.